There’s no doubt that new born babies need a lot of stuff. The smaller they are the more stuff you seem to need to take around with you. There’s a whole market out there designed to play on every potential concern you might have about parenting and then provide you with the ideal item to deal with it. It’s a bit like going into Lakeland. I go in there and find product solutions to homeware problems I didn’t even know I had! But it’s worse with a new baby because this is their whole lives we’re talking about, so by not buying that particular all-singing, all-dancing whatever they’ll be irreversibly damaged forever…and it will be all my fault! Second time round we’re veering towards cynical and besides, we’ll mostly be re-using what we had for Little Owl. So, I can’t really say if it’s because we’ve been bought, or have bought, such a small amount of new stuff that I’m excited to share it with you or whether these things really are as fabulous as I think. I suppose the proof will be in the testing! 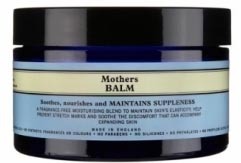 First up is the Neal’s Yard range for mums. I was bought the Mother’s Balm and the Mother’s Bath Oil by a lovely friend. They smell amazing, feel gorgeous and are all made from natural organic ingredients. Neal’s Yard isn’t cheap so if there’s one time in your life to splash out, impending motherhood is the time to do it. We went down the washable nappy route with Little Owl. We bought the first stage and were given the second stage second hand (don’t worry, the person who gave them to us is scrupulously clean!). Some people go scary fundamentalist about washable nappies (they do it with breastfeeding too) so I won’t say any more about why we liked them (Which? have a good page here if you’re interested). Anyway, it never quite added up for me that I was using washable nappies but disposable wet wipes and there’s only so long you can carry on with the whole cotton wool and water faff. Plus, how rubbish are wet wipes in the face of a weaned baby’s bum anyway?! 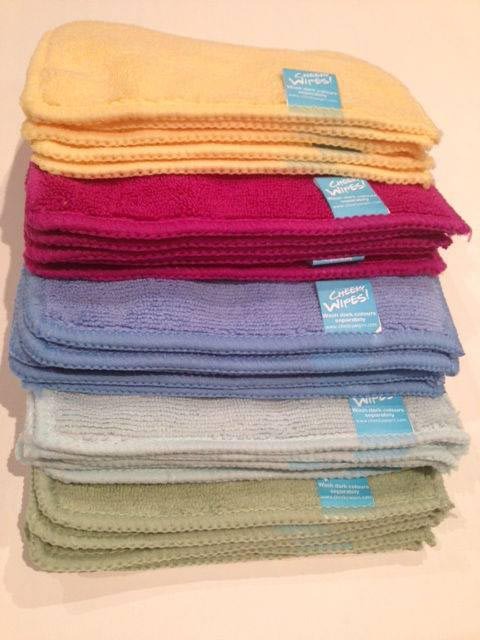 Just like that awful blue dish cloth stuff you can buy on a roll – ever tried washing up in a commercial kitchen with that? Hopeless! The answer? Cheeky wipes! My friend has used them for both her boys and has bought me a lovely rainbow coloured set. She doesn’t bother drying them when they come out of the washing machine but puts them straight into a tupperware box. I can wash them with the nappies so no extra hassle. Apparently the only thing is to remember to take any clean leftovers out of the change bag at the end of the day or they go a bit smelly. I think I can handle that! Breastfeeding is a funny old thing. I managed quite a while with Little Owl and am planning to do it again but I hated every minute of it (no death threats please!). I think if I’d been one of those lucky ladies who sail through pregnancy like a glowing incarnation of Gaia I’d have felt differently, but nine months with your head down a toilet or feeling like it should be down there (or just wondering if I should flush myself down and be done with it!) change your relationship with your body and I just wanted mine back. So, anything that makes breastfeeding a little more bearable is alright by me. One of those things might just be a Breast Vest. Essentially it allows you to lift up your top to breast feed without exposing your abdomen. A friend of mine says I may have to tuck the straps under my bra as they can fall down but other than that she loves hers. Probably for the same reasons as I struggled with breastfeeding I never subscribed to the the whole ‘baby-wearing’ phenomenon with Little Owl, but I did find a sling helpful most days. We had a hug-a-bub stretchy wrap sling, which worked well when she was very small but soon fell out of favour. I found it gave my back no support and because the material was stretchy, no matter how tight I pulled it, she seemed to slip down. This time I’ve gone for an Ergo. A friend of mine who uses the Tube regularly with her little ones (yes, she’s incredible) uses a Yamo, which is very similar to an Ergo. Her superwoman example has made me covet her sling for this baby so we got one on Ebay. Apparently there’s a big problem with fakes so if you’re worried you can get them at John Lewis but expect to pay three times the price (with all the added extras) you would for a second hand one. 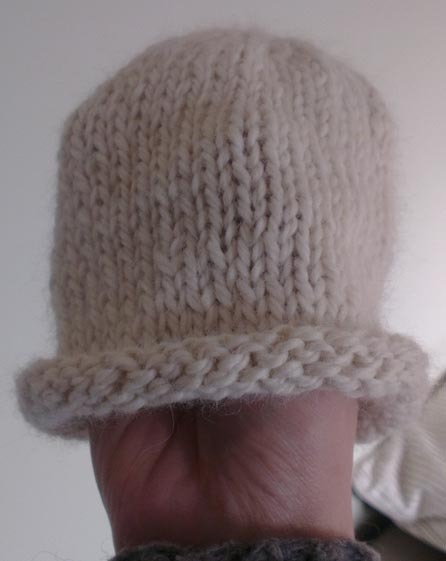 Lastly, we have been given this super sweet knitted hat by another wonderful friend. I know knitted baby things can be a bit hit or miss but we’re very lucky to have people around us who are not only talented but also have good taste (phew!). Big Dreamer’s grandma knitted us some gorgeous bonnets for Little Owl and I know his mum has got some lovely things up her sleeve too. This hat has gone straight in the hospital bag for first outfit home. My friend knitted it with baby alpaca yarn so it’s so soft and best of all, it’s one of a kind, not available anywhere! This entry was posted in Family and friends, Making changes and tagged alpaca, babies, baby wearing, bonnets, breast vests, breastfeeding, cheeky wipes, ebay, equipment, ergo, friends, fundamentalist, Gaia, hat, hug-a-bub, John Lewis, knitted baby clothes, knitting, Lakeland, mobiles, Mother's Balm, Mother's Bath Oil, motherhood, Neal's Yard, new born, pregnant, real nappies, secondhand, sling, stuff, unique, washable nappies, wet wipes, yamo. Bookmark the permalink.